Join Peppa Pig and her new friend, Gabriella goat, on a vacation adventure. 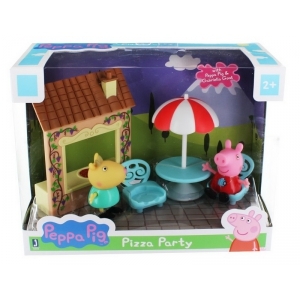 Order yummy pizza from the village Caf then sit Peppa and Gabriella at the Bistro table to enjoy it.The table, chairs and Caf window are all perfectly scaled to play with your other Peppa Pig playsets and vehicles (each sold separately).Includes Peppa and Gabriella figures. Collect them all and play with all of Peppa's friends. Join Peppa Pig and her new friend, Gabriella goat, on a vacation adventure. Order yummy pizza from the village Caf, then sit Peppa and Gabriella at the Bistro table to enjoy it. The table, chairs and Caf window are all perfectly scaled to play with your other Peppa Pig playsets and vehicles (each sold separately). Collect them all and play with all of Peppa's friends.